Friday saw us make the short journey across the Pennines over to Manchester. 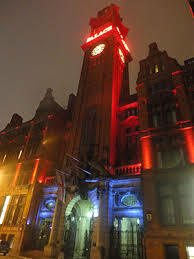 We were booked to play the evening and night reception for Jordan and Ruth at The Palace Hotel in the city centre. To be booked to play in a vibrant city centre like Manchester really does add a buzz to the day. As wedding musicians who have been gigging all over the country we have seen some changes in the towns and cities which we’ve travelled to perform in. 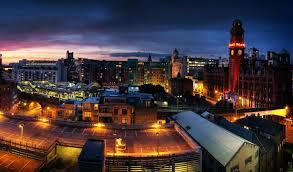 The city of Manchester is a perfect case in point. Between the years of us playing venues such as The Roadhouse and The Night and Day, in the late 90s, Manchester has now evolved into a vibrant, bustling, booming capital of the north. Wedding couple Jordan and Ruth had chosen The Palace Hotel with its art-deco furnishings to hold their ceremony, meal and evening function- of which we had the honour of playing. They had chosen two first dance songs to be played consecutively, the first being the beautiful Baby I’m Yours recently performed brilliantly by The Arctic Monkeys, originally recorded by Barabara Lewis in 1965. The second song they requested was You’re My Best Friend by Queen. Jordan and Ruth were a great couple to play for, as they were so relaxed and intent with going with the flow. Their guests asked for a whole range of requests dating back to Beatles classics, to Indie anthems such as James’ Sit Down, where everyone promptly took to the dance floor and did ‘sit down’! We concluded the set with a rendition of Hey Jude segueing into Elbows One Day Like This, and as requested, playing The Cures Fridays I’m Love as an encore. We played for about 3 hours in total and not once was the dance floor empty. Jordan, Ruth and their guests where determined to have a great night and there was no holding them back! As we packed our speakers down, it took us about half an hour just to get out of the door, we had so many compliments off their guests saying what a great night they had had. There energy for partying didn’t stop there either, as only 5 hours later the new Mr and Mrs Parnell were boarding a plane to New York! As one of our first weddings of the 2015 wedding season, this really started off the with a bang. A brilliant venue with the perfect couple and lively, enthusiastic guests.